Place all of the ingredients into a mixing bowl and whisk until the mixture is smooth and creamy. Place in the refrigerator for at least 4 hours or overnight to allow flavors to infuse together. Sauce can be stored in the refrigerator in an airtight container for 3 to 4 weeks. Bring sirloin steak out of the refrigerator and allow it to sit at room temperature for even cooking. Salt and pepper both sides of each steak. Note: I usually use salt after the steak is cooked to maintain juiciness because salt immediately draws moisture out. Heat skillet on high (I use cast iron), Drizzle oil on pan for a thin coat. Add butter and allow to melt. For medium rare, sear steaks 4 minutes on each side. Turn off heat.Remove steaks from pan and let rest 5 minutes. Then slice thinly against the grain with a sharp knife. Toss sirloin steak strips back into pan with buttered drippings. Stir to coat evenly. 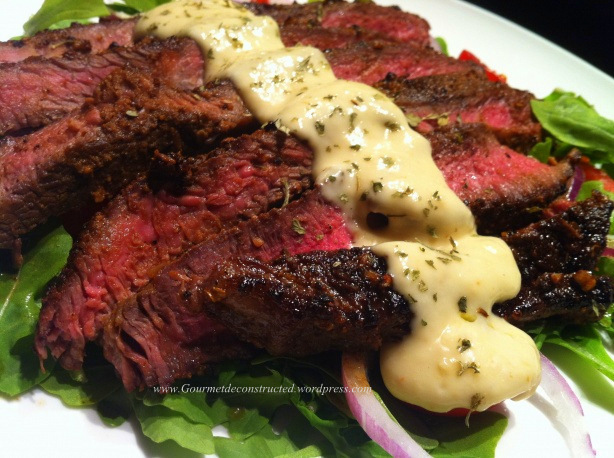 Serve immediately over a bed of arugala or salad of your choice and drizzle with horseradish sauce. Bon Appetit! Posted on August 13, 2011, in Beef. Bookmark the permalink. 8 Comments. Wishing I can taste that about now!!!! Look tender and moist just like I like it with just a little red in the middle. im so curious to know the taste of the horseradish sauce.. i so wish i can taste all of it. love the presentation too! first time in your space….n i absolutely loved ur space…..following u here….do visit my space sometime !